This started as a singular long exposure before sunrise on beautiful South Beach in Miami, FL. There are quite a few of these lifeguard stands that are manned during the daytime hours to protect beach goers. 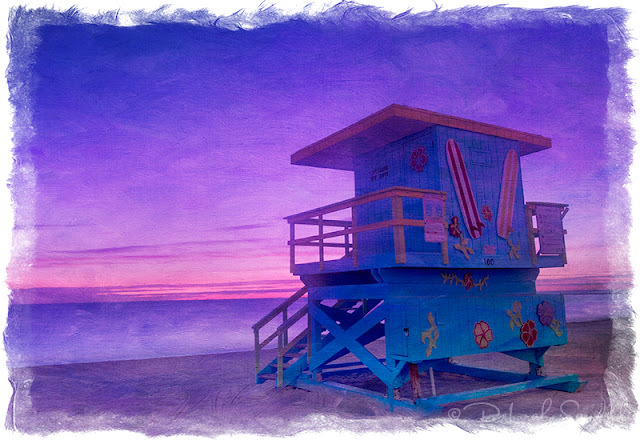 Before the sun actually rose, the sky was violet with a pink hue and I wanted to work with this idea a bit in Photoshop to create a fun and painterly look. I used several layers of texture to create the look in this image. I started with Lavender Skies and a blend mode of Overlay, and used a second texture, Brushed Rose with a blend mode of Hard Light. A Hue/Saturation adjustment layer was added to sway the colors in the texture to a more violet and purple hue, very easy to do from the Adjustment Panel in Photoshop. The textures were brought out with the various blend modes and complemented the life guard stand nicely. From the Layers Palette, you can scroll through the various blend modes to see the effect each has on your image by making sure the Move tool is active, and holding down the Shift and the plus or minus key. The textures used here are from Flypaper and they are truly one of my favorites of textures to work with. Try them and see why! Click here to visit Flypaper Textures. This was a lot of fun to create, and the finishing touches work out beautifully by using a canvas looking edge treatment by Jack Davis from OnOne PhotoFrame. This filter set has every edge treatment, border, frame, embellishment, and overlay available, to make the perfect picture. OnOne PhotoFrame... you can use coupon code DEBSANDIDGE. Interested to know more about enhancing your images? Join me in class next month at BetterPhoto.com - I hope to see you there!